The Camperdown Elm, planted near the Boathouse in 1872, has developed into a stunning specimen. No more than 12 feet high, it resembles an over sized bonsai. It is the most famous specimen tree in Prospect Park. The weeping shape of this elm is extremely attractive and a peek under the canopy reveals an amazing branching structure. The many cavities in the branches and the size of the trunk show that this is an older tree. Between 1835 and 1840, the Earl of Camperdown’s head forester, David Taylor, discovered a mutant contorted branch growing along the ground in the forest at Camperdown House, in Dundee, Scotland. The Earl’s gardener produced the first Camperdown Elm by grafting it to the trunk of a Wych Elm (Ulmus glabra) - the only elm species that the Camperdown will accept as a root stock. Every Camperdown Elm in the world is the product of a cutting taken from that original mutant cutting and is grafted onto a Wych Elm trunk, usually 4-6 feet above ground. 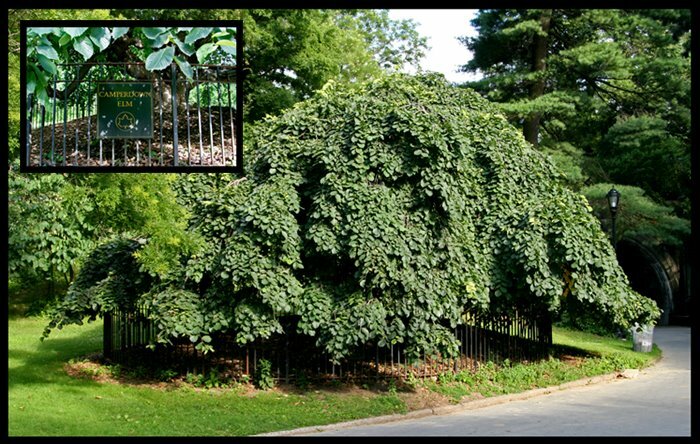 Suffering from severe decay a century after its donation to the Park, the elm’s fifteen minutes of fame arrived in 1967 when Marianne Moore’s poem about it helped raise funds to pay for its treatment.